Century Cycles is proud to be the exclusive bicycle shop sponsor of STOMP (the Summit Tour Of Metro Parks), one of the largest bicycle touring events in Northeast Ohio. Registration includes light breakfast, SAG support from our expert mechanics, lunch, live music and more. 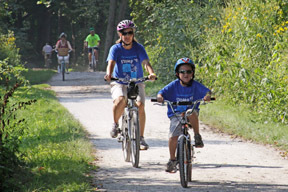 Route options are 10, 20, and 30 miles, all family-friendly routes entirely on the Ohio & Erie Canal Towpath Trail, beginning at Lock 3 Park in downtown Akron. Is your company having a wellness fair? Summer Clearance Sale Going On NOW! Poll: What's your longest bike ride?